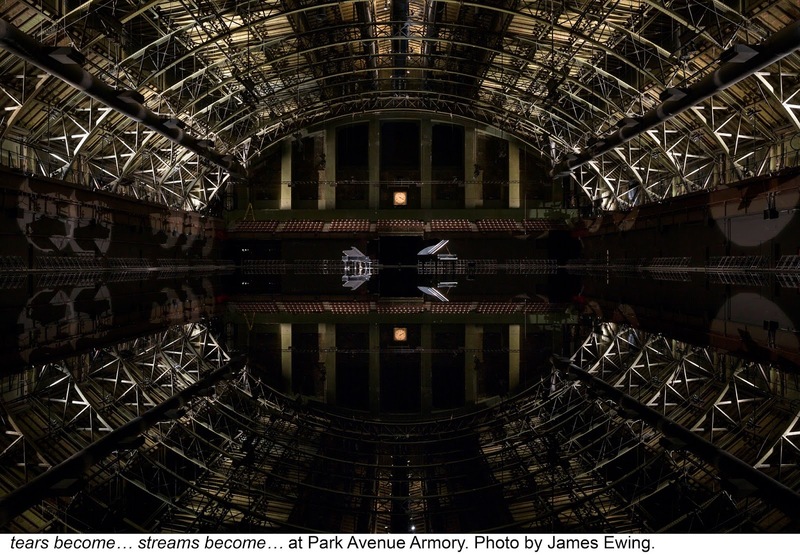 It's an unlikely time of year for the Park Avenue Armory to mount tears become... streams become..., given that its premise is to flood the Armory's vast hall along artist Douglas Gordon's specifications, and have pianist Hélène Grimaud give a concert of water-themed piano pieces (or at alternate times, have a player piano operating). Especially during weather like this week, when rain drenches the cold air. But the Armory has not shied from ambitious projects that few other presenting institutions in their right minds would undertake. The logistics of the project alone are breathtaking. At a press preview, as Grimaud sat on her piano island (there are so many metaphors to this image alone) surrounded by mostly dry black material, water began to seep up through the seams, nearly silent except for a stray burble or bloop. In a matter of minutes—under 10—the Drill Hall was a glassy pond. Grimaud played Fauré's Barcarolle No. 5 in F# minor, Op. 66, and Berio's Wasserklavier. While the acoustics are challenging, the effect of one brilliantly played piano floating on a glassy lake was transporting. Gordon sat beside her, giving lighting cues; after she was done, they walked through (on?) the pond to the dry deck, sloshing and looking like beached shipwreck survivors. Grimaud wore a sporty white track suit designed by Agnès B. The most surprising and powerful aspect is how the hall's ceiling and roof trusses were illuminated by the choreographed lighting cues. From engulfing darkness, the east/west spine at the apex of the hall's ceiling was lit gradually. Then the "ribs" of the ceiling's armature were emphasized, and it appeared—seated at the very center to capture the symmetry of the ceiling in the reflecting water—as if we were in a giant whale's ribcage. Spots hit Grimaud's piano, and then the idle player piano. This tranquil yet humbling image will likely never be replicated in the middle of New York City... one more singularly memorable experience in a one-of-a-kind space, provided by the Park Avenue Armory.